Back in the day when CRM2011 was first in beta I blogged about the exciting SharePoint integration and how it works. This post is about the exciting new server side SharePoint integration that is now available as part of CRM2013 SP1 Online. There has already been some good posts on how to set up SharePoint sever-side Sync but in this series I'm going to explain how the server to server integration works in more detail and run through some scenarios of how it can be used for custom solutions. Before CRM2013 SP1 was released the only option for SharePoint Integration was to use the CRM List Component. Each document location was surfaced on a record form record via an IFRAME that placed a SharePoint page inside the CRM page via the list component aspx page. This SharePoint page rendering the document library's default view with a CRM theme and provided the upload/download commands. The CRM form page is displayed in the browser and including an IFRAME that requested the configured document library page from SharePoint. 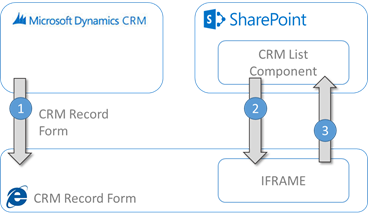 The IFRAME shows the SharePoint document library styled to look like CRM. This required the user to be independently authenticated with SharePoint. Using any of the actions in the page (New/Upload etc.) sends requests directly to SharePoint. This approach worked well but since the user was accessing SharePoint directly within the IFRAME they'd sometimes encounter authentication issues where they must be authenticated with SharePoint first and sometimes SharePoint needed to be configured to allow inclusion of content in IFRAMES. In addition to this the list component required a sandbox host to run but this feature is being phased out in SharePoint Online. With the introduction of CRM2013 SP1 a new type of integration has been developed that provides direct server to server integration between SharePoint and CRM thus removing the need for the user to be pre-authenticated with SharePoint on the client. The Record page includes a standard sub grid that is populated using the CRM entity query object model. 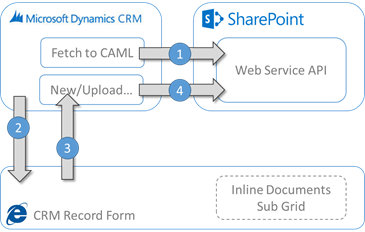 CRM converts a RetrieveMultiple request on the SharePoint Document entity into SharePoint CAML (Collaborative Application Markup Language) query and sends it to the SharePoint Web Services. The important part here is that this query is run in the context of the currently logged on user and so they only see the document that they have access to in SharePoint (more on how this works in part 2 of this series). Documents are rendered inside the CRM Form HTML as a standard sub grid in the same way that any other record might be displayed. Using the New/Upload command bar buttons sends a request to CRM by way of an Execute Request in the same way that any other command bar buttons might do. CRM uses the SharePoint Web Service API to execute the requests and refreshes the sub grid. This server to server integration only works for CRM Online/SharePoint Online combinations that are in the same tenant due to the nature of the server to server authentication and can be turned on in the Document Management Settings using the 'Enable server-based SharePoint integration'. There is a note that states that sandboxed solutions will not be supported in the future for SharePoint online. The S2S sub grid doesn't support folders within the document library and so all documents are flattened down underneath the document location folder. The Location column does give you folder name which you can sort by to allow grouping by folder. The great thing about having the documents queried by CRM is that you can create custom views of documents in the same way you would with any other entity in CRM. 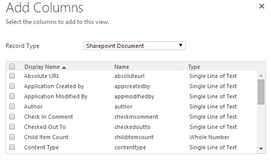 When using the list component the default view in SharePoint was rendered in the IFRAME meaning that to get new columns you had to have list customisation privileges on SharePoint such that all users would see the changes. With the new server to server integration you can select SharePoint columns to include in your own views and even add in your own filters using the CRM advance find interface. If you think about it – this is very cool! The List Component was by nature very similar to the SharePoint list user interface and so it had more or less full support of actions that can be performed from SharePoint (with the exception of workflow operations). The server to server sub-grid provides all the main functions but with some options such as Alert Me, Send Short Cut, View History and Download a Copy being unavailable. This is in comparison to the List Component actions that are as shown below. With CRM2013's single page user experience any pop-out windows are supposed to be kept to a minimum. 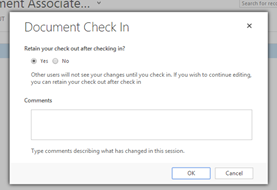 When using the list component operations (such as check-in/out) a new window would always pop out but with S2S integration an inline dialog shown instead. This really make it feel tightly integrated and slick. Out of these differences, the lack of folder support is the only one that has had any significant effect on my solutions but actually can be seen as an advantage if using sub-folders to hold child entity documents. In this scenario all documents will be visible from the parent record's document view rather than rely on the user drilling down into each folder to see content. That's all for now but in the next article in this series I'll show you more of how this functionality works under the covers.